Big thanks to Libby’s for sponsoring today’s post. I’m starting to sound like a broken record this month, but I really love how the food around the holidays reminds me of loved ones and years past. It’s definitely the time of year that I turn to beloved family recipes the most. Nate’s Gram Maynard didn’t cook much, but she had a few signature recipes that were pretty much perfect. Like potato salad – it was simple, reliable and perfectly flavored. And her homemade hot fudge was to die for. 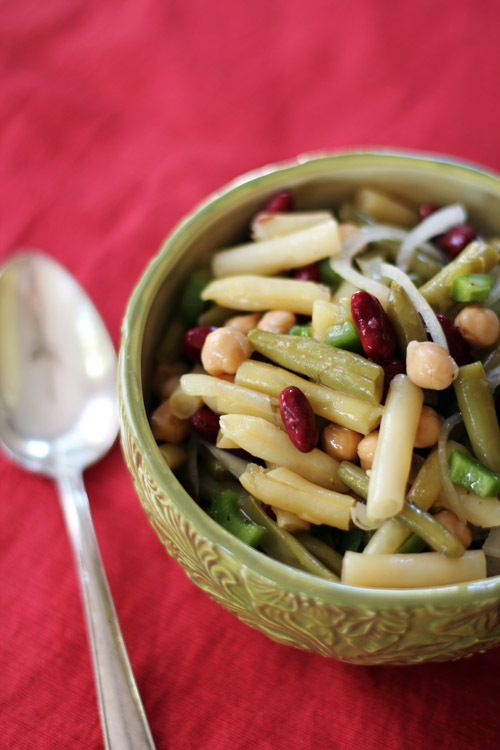 Another one of her recipes that we loved was her marinated 4-bean salad. 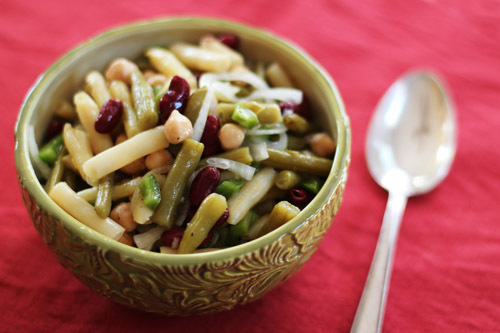 It appeared at every family gathering and, even though Gram is no longer with us, the bean salad is always still on the table when we all get together. Just seeing that bowl of beans instantly reminds me of Gram. Thankfully we have the recipe and can recreate the magic whenever we want. 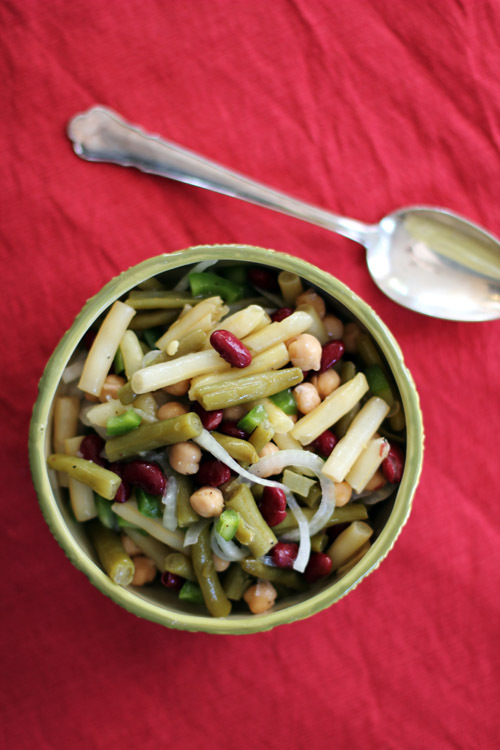 I love this 4-bean salad because it is beyond easy to throw together, has just the right amount of sweetness and goes with pretty much anything. Plus, for our family, every bite reminds us of Gram, which is especially welcome around the holidays. 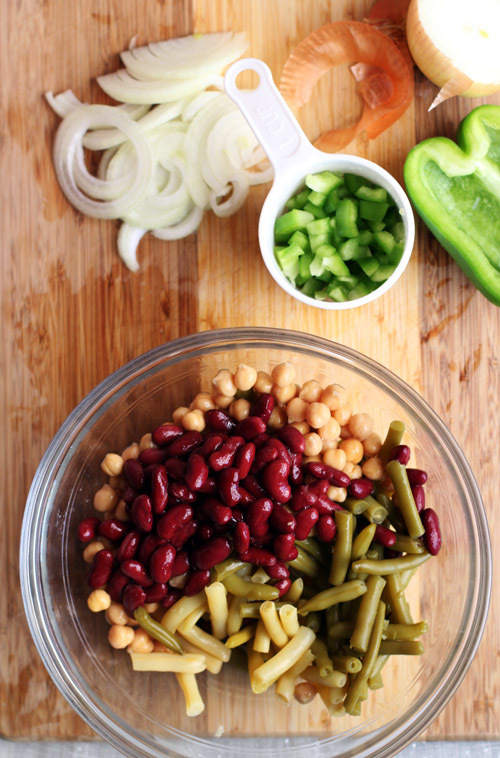 In a large bowl combine the wax beans, green beans, kidney beans, chickpeas, onions and green peppers together. In a smaller bowl, whisk together the vinegar, oil, sugar, salt and pepper. Pour over the bean mixture. Stir, cover and refrigerate for at least 6 hours. Over the years I have been lucky enough to have several close friends who are Mexican and they have all introduced me to various wonderful foods. Those friends are all also really good at cooking beans. And, for whatever reason, no matter how many times they have told me how to cook beans and assured me that it’s easy, I had a mental block. 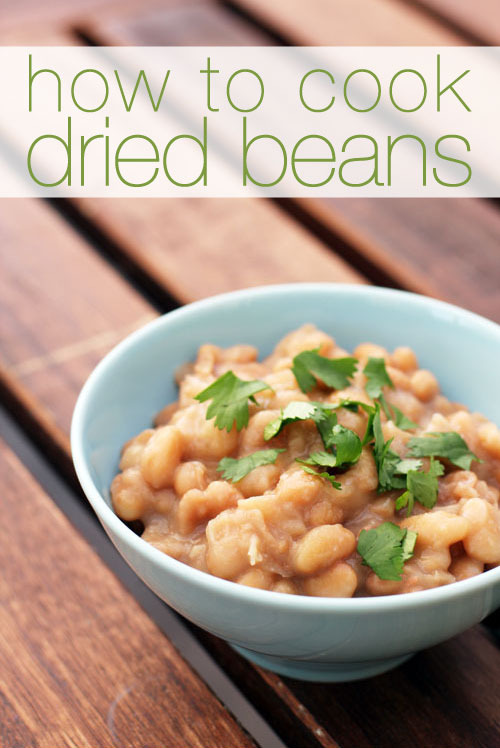 Every time I would go to cook a bag of dried beans, I would freeze. Seriously, total mental block. 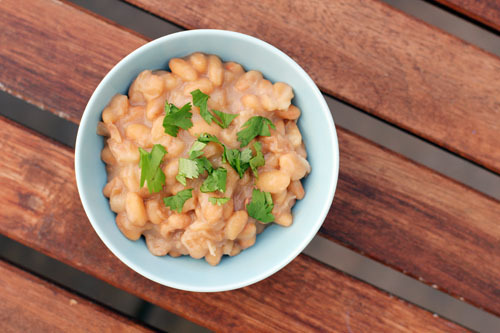 I just could never remember exactly how to do it and felt dumb always asking “one more time” how to cook beans! Well, I have finally broken down my bean barriers. One of my neighbors is Mexican and I finally just sucked up my pride and asked her (multiple times) how to cook dried beans. And then I actually did it. I cooked beans! And, surprise surprise, they were easy to make and mighty delicious! For real, it’s easy. You’ll need to be home for a few hours to check on them occasionally while they cook, but that is seriously the hardest part of the recipe. 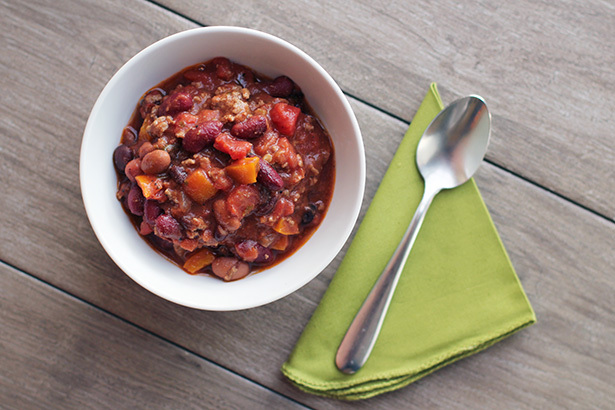 I like to cook a big pot of beans at one time and then freeze the leftovers into 2-cup containers. 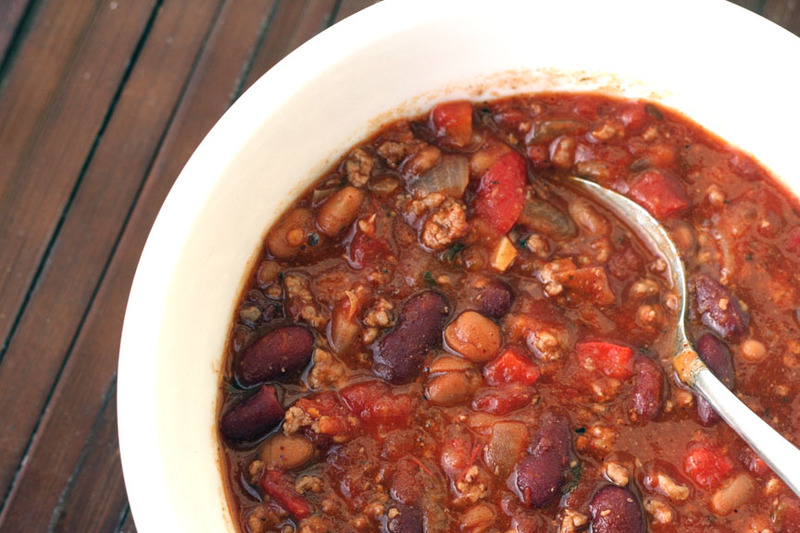 The beans are easy to defrost and I love having them on hand. And they really do taste better than canned beans. Ari (my neighbor) will sometimes soak the beans overnight, but it's not necessary. If you forget, no worries! Place the beans in a big pot (I use my french oven). Add water to cover the beans (if you soaked the beans prior, drain that water and add new water to the pot). Place ¼ of an onion (large pieces is fine) in the pot along with some salt (maybe about a teaspoon or so). Bring to a simmer over medium to medium-high heat, then cook over medium-low to medium heat for 2-3 hours (longer if you didn't soak the beans before hand). Stir the beans occasionally throughout the entire cooking process. 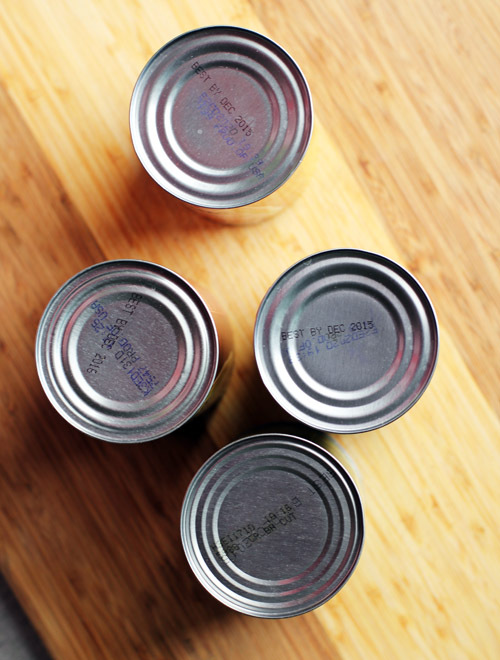 You may need to add more water at some point if the water is running low but the beans are still not cooked through. The beans are done when they are soft and yummy! Remove the onion and add more salt if needed. 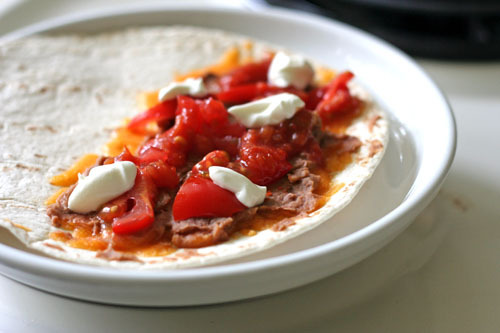 If you want them to be more like refried beans, just mash them up a bit! The recipe I’m about to give you is dangerously delicious. 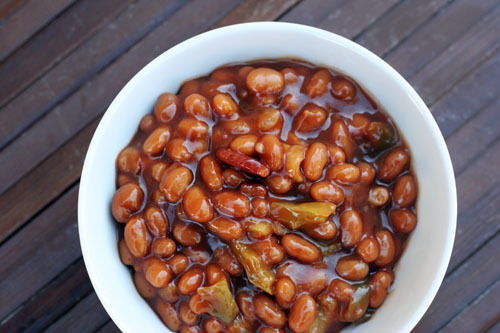 If you like baked beans, you’ll LOVE these. I made them for the 4th of July and they were a hit, even with my most-of-the-time-vegetarian friend. 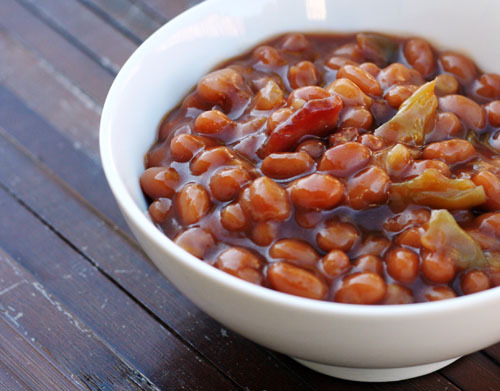 Thanks to my mom’s sisters who introduced me to this baked beans recipe to begin with. I have no idea where they originally got it from, perhaps I should do some digging. Wait. I’m rambling. Enjoy the beans! Sauté the onion and green pepper over medium heat until starting to get soft. Add the bacon and sauté until bacon is cooked through. Drain grease. Mix the spices together and sprinkle on one side of the chicken breasts. Heat the oil in large skillet to med high (I use a sauce pan, higher sides), add chicken seasoned side down and brown (3-4 min). Turn over chicken and add tomatoes, beans and artichokes, cook 5 min. Reduce heat and stir in olives, cook another 5 min or until chicken is done through and sauce thickens a little. Serving = 1 breast + ½ cup or so of the chunky sauce! I serve this with brown rice, cooked in chicken broth. 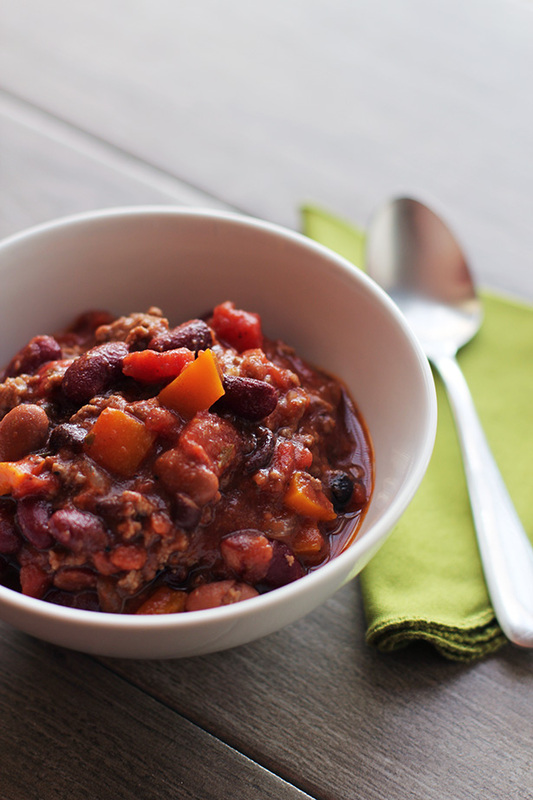 Click here to see a dedicated blog post about this recipe, with adaptations and notes on the recipe provided. Heat oven to 400° F. In a medium bowl, combine the beans, corn, and salsa. 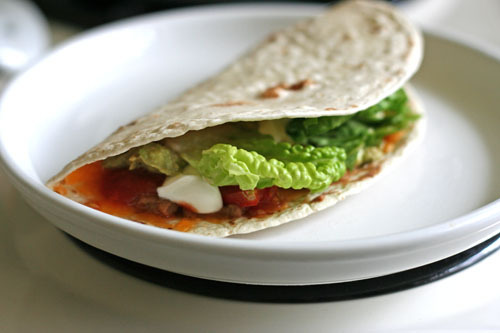 Place 4 tortillas on a parchment- or foil-lined baking sheet. 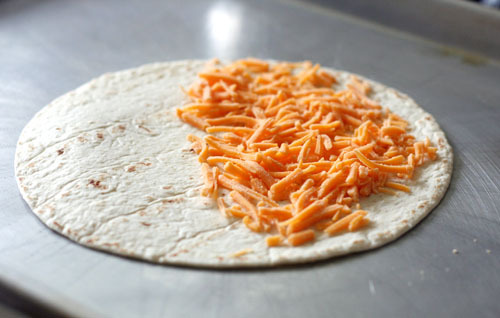 Sprinkle with half the cheese. 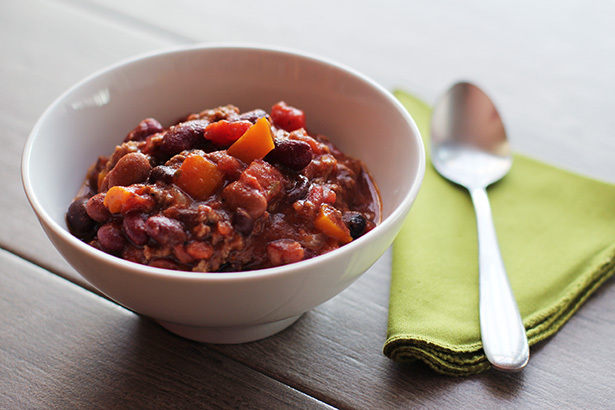 Using a slotted spoon, transfer the black bean mixture on top of the cheese. 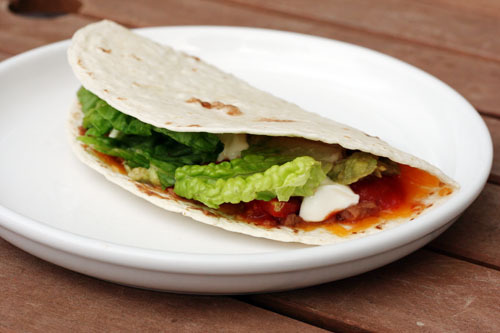 Sprinkle with the remaining cheese and sandwich with the remaining tortillas. 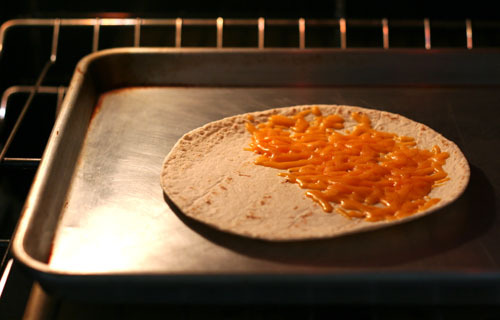 Bake until the cheese has melted, 5 to 7 minutes. Meanwhile, in a large bowl, combine the onion, cilantro, salt, pepper, lime juice, and oil. Add the lettuce and toss. 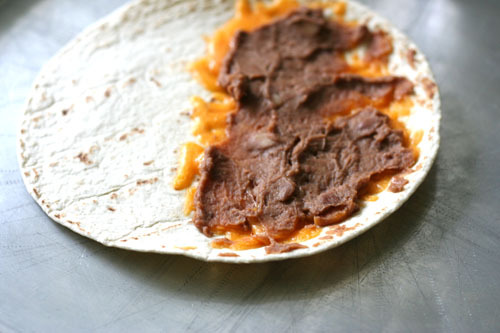 Transfer the quesadillas to a cutting board. Cut each into 6 wedges. Serve with the salad.